Boasting more than 200 attractions, Splash Works and a huge variety of roller coasters, Paramount Canada's Wonderland is deservedly the country's favourite theme park. 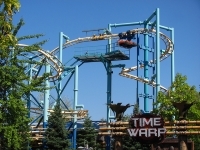 Its menu of rides includes carousels, train rides and the Time Warp ­- Canada's only flying roller coaster. The park also has lots of shopping and dining options. All told, this attraction has a variety of rides and amusements to suit all age groups, and is a must for the entire family. Opening times: Opening times vary according to season - check the official website for details.